social correlation. It spreads the unity, reclaims own ethnic identity and upholds the tradition in social change. 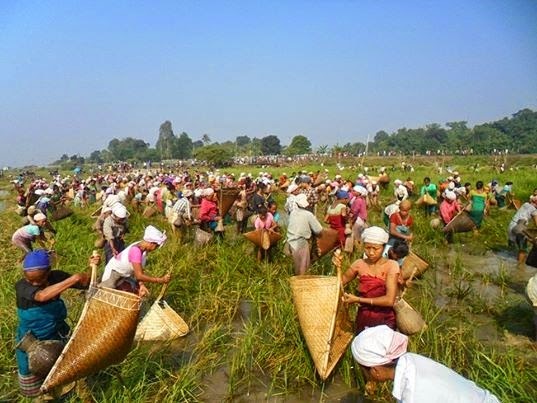 In the eve of ‘Kati Bihu’ festival of Assam, prior to Diwali celebration, such an activity is seen every year performed in the beel/water body located along Barahu railway station [Latitude: 26.116304 and Longitude: 92.139523], a walking distance from the point of NH-37, Bamfor. This beel/water body is actually the paddy field left after harvesting Boro cultivation in summer. The locality is based on agriculture which falls under Dimoria, Kamrup (Metro) district, Assam. The fishing beel near Bamfor at Barahu under Dimoria is not too far from the state capital of Assam, it’s in outskirt of about 50 km from Guwahati city, but the area is indeed underdeveloped, which is a true picture of greater Dimoria area. The area requires developing with proper surface connection, electricity, sanitation, drinking water, etc. Being an agro-based area irrigation facility for the paddy field is still a distant dream and farmers are dependent only on natural shower. And above all the medical and educational facility is essential, but these services are very unsatisfactory in the area. Bringing out this issue of Dimorian Review e-Magazine is a never before experience. This issue consists of different tastes of write-ups. Two featured articles written on two major musical forms prevailing in Assam, i.e., Bargit and Goalpariya Lokgeet, are adorning this issue. The writers are narrating some conceptual knowledge about these two musical forms.Again two articles signifying spiritual destinations of Assam, one article on modern architecture and two more articles written on socio-cultural aspects, such as,Diwali– a major festival in India and Hornbill Festival organized in the month of December every year in Nagaland are really informative for readers. This is a season of holiday and outing and we are bringing two articles on popular tourists ‘destination, one is Kaziranga of Assam (open from November till mid-April) and other is Dzukou Valley of Nagaland (June to September). Both locations are considered hotspot for tourists. Moreover, two travel stories on trekking & mountaineering, such as, Pindari Glacier of Uttarakhand and Miodia of Arunachal Pradesh are added flavour of this issue. Both the locations are beautiful and attractive for adventure tours. This is autumn following winter and in the autumn ‘Night-flowering Jasmine’ (Nyctanthesarbor-tristis) or ‘Sewali’ in Assamese, blooms at night and falls down on the ground. But this flower can be a good and tasteful recipe. The food blogger Madhusmita Kalita Pathak brings to readers details about it in our recipe section in addition to pickle prepared of mango & ghost pepper. About money into investment we are referring one real story - how a Mumbai based grandmother created her wealth in stock market.We are including one more article for reference on world technology - Global WiFi Internet Services. On the other hand, in the category for individual, we are trying to tell something about two persons’ life and work, they are Muralidhar Das and Late Balairam Senapati. Again on the lighter side, a short story has been published which is good to be read up. We thank to all the contributors, writers for helping us shaping this issue. We are indebted for their unconditional association with creative contents. Dimorian Review, a bi-monthly e-magazine promoting primarily art, culture, literature and tourism, was started in 2012 on experimental basis and it is now regular online with an Editorial Board.The last two issues of Dimorian Review was published during July-August 2014 and September-October 2014 as special poetry issues with the title ‘Dimorian Anthology of Poetry’ (DAP). This issue (Vol-1, Issue-3, November-December 2014) is released with different categories of write-ups. We are trying our best to cover the uncovered and let people know about the North-East India. Readers’ comments and feedback towards development would be highly appreciable, have good reading!